We are back in Richmond after three and a half very cold days in the Nation’s Capital. We met and featured many local people from Central Virginia during our coverage. I thought you’d like to see some of the behind the scenes stuff that never made it on to TV. This was our first brush with a crowd on Sunday. We are on our way up the escalator of the Smithsonian exit of the D.C. Metro. Rarely were there any exits or entrances to metro stations that weren’t packed. That is our Field Manager Matthew Harris who played an important role in making sure we filed all of our stories and got to our live shots on time. To see more behind the scenes pictures click here. Sorry for the lack of posts today. I have had limted access to my laptop and my NBC12 TV stories took up all of my time. It has been a hectic and crazy day. Sabrina Squire and I will be live tonight at 11. Tomorrow after I get back to RVA. I’ll get some photos up and give you a behind the scenes look at our coverage. Good morning from the Nation’s Capital on Inauguration Day 2009. We are slowly getting prepared to make the trek into the city. We found a driver with credentials who promises to be able to get us right where we need to go, so we can avoid the Metro. It will be my job today to navigate the massive crowd to find people from Richmond and get their story. We have already been reporting live this morning. Sabrina and I will begin our live reports in the 5pm newscast and we will be live on the mall right through 11. I will probably have limited access to the laptop today, so keep tabs on our first hand account by following my twitter page and the new NBC12 twitter page. To see our coverage from Monday night click here. I’m the shadow.. pretty cool. It is the day before Inauguration day and I have got the chance to meet up with some nice people from Richmond. Here are some pictures from some of the things I have seen today. Here is where our live truck is located. We are at the corner of 7th and Madison. (If you are coming to DC come on by). I took the picture, with the port-a-johns in the frame on purpose. I have never seen so many portable toilets in my life. They are literally every ten feet. So feel free to have that coffee before you make the trip up. Traffic has picked up quite a bit in the area by the mall. Here is a look at one of the many intersections near the mall. It is a confluence of big trucks, big buses and tourists trying to figure out where to go. Keep in mind that it is busy today, but those personal cars you see won’t be here tomorrow. However there will be way more people making their way on to the mall. Although, I am not sure about the rickshaws. Sabrina is live at 5, 5:30 at 6. I will have reports at 5 and 5:30pm. Day One of our live Inauguration coverage is in the books. Our morning crew gets day two started with their reports early tomorrow morning at 5. 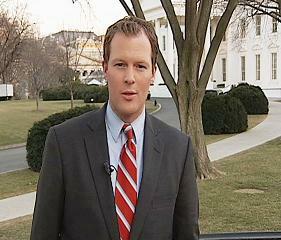 Aaron Gilchrist will lead our coverage during the morning show and at noon. Sabrina Squire, who worked very hard today, to get the flavor of the event, will be anchoring live starting at 4pm. I will join her with reports during the early evening and late night newscasts. Don’t forget to stay up to date, by following our special NBC12 Inauguration page and by following me and NBC12 on twitter. We are still two days away from the Inauguration and Washington, D.C. is already very busy. We have been to many of the important spots in the City and have already reported live.